Right, here we go with my first ever podcast! I should say right away that this is NOT the radio show and has NOTHING to do with the BBC. It has everything to do with the kind of songs you can find on my myspace site or by clicking on the 'tom morton's songs' link over on the right. tag, you should be, well podcasting. Err...obviously you don't have to. What is on the Podcast? Well, basically, it's just me and a guitar (or two: Martin Shenandoah D28 and Moon 003) singing and talking into my trusty Tascam digital Portastudio, which lives, along with double basses, cellos, mandolins, banjos, drums and pianos, near but not in The Barn of Bannocks. Anyway, it's here if you're in any way podcasting-inclined! I'm excited! ...their great battle songs a-thunder on the blast!" The entry of the 2006 Northmavine Up Helly Aa Jarl Squad into the Hillswick Hall in the early hours of Saturday morning. Play the video! Just 30 seconds I'm afraid. More Morton music now available! ...if you can be bothered, check out my new myspace page which is at www.myspace.com/tommortonmusic. I'll put a permanent link up over in the right hand links column in a minute. You can download or listen to four songs there. If you feel inclined, sign up as a 'friend'. Up Helly Aa was great, by the way, and pictures, possibly even video, are on their way. 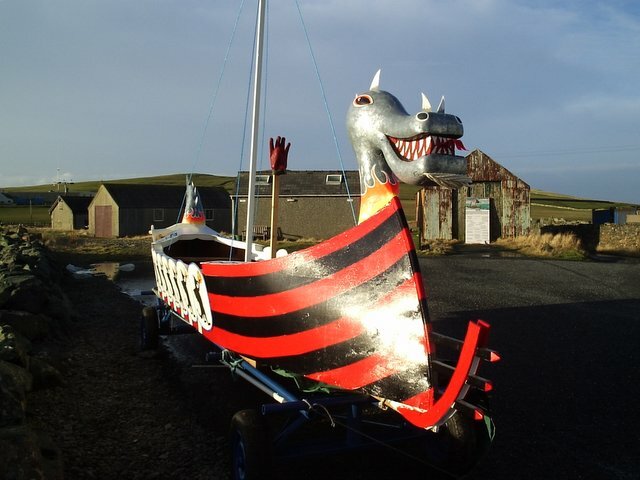 It's Up Helly Aa day in Northmavine, and the galley Hankavaar, constructed over the past two years (last year's festival was cancelled following a local tragedy)sits sparkling in the Hillswick sunshine even as I write. Chief viking for the 'day' (which will last until around 8.00 am tomorrow! )is Ivor 'Hank' Hughson, and he will lead his band of merry men (and females - my daughter is a viking princess this year) around the local schools and other establishments during the day, until the procession and burning of the galley tonight. This will be followed by dances in the Sullom, Hillswick and North Roe Halls until the wee sma' hours, along with skits performed by the squads of guizers who accompany the Jarl's vikings in the procession. These sketches promise everything from innocentjapery to scabrous social and political satire, and beyond. I have the programme here and performances will include: "Lowrie goes to da races and nips his pillie in da car door" which I don't think I'll translate from Shetlandic. "Running Bare" fills me with foreboding. There are several Up Helly Aa fire festivals in Shetland each winter, signifying 'the lightening of the year' as winter begins to retreat. Lerwick is the biggest and most formal, but Northmavine is usually the most fun. Copyright Tom Morton 1993/2005. All rights reserved. 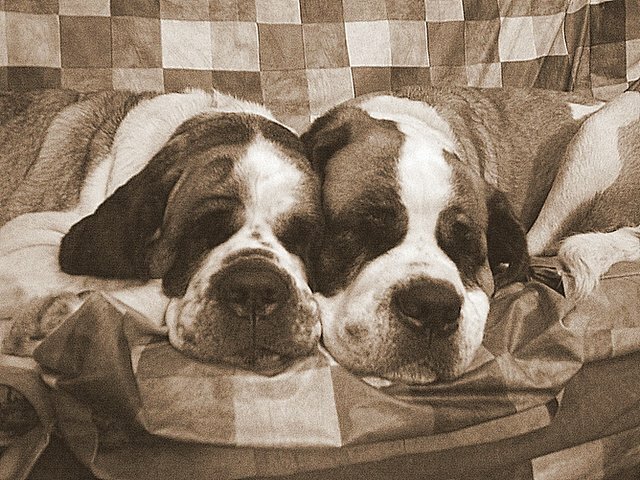 I know, there are too many pictures of St Bernards on sofas on this blog, but I couldn't resist Lulu and Lucy in this sisterly pose. Back in Shetland, with the Northmavine Up Helly Aa on Friday, in which my daughter is a viking princess. I fear that the St Bernards, not to mention the infamous Nippy's Pillie (see archives) will feature in 'da bill', as the satirical announcement that accompanies the festival is called. Meanwhile, I have guitar news to impart, once I've managed to take some pictures of my beautifully-repaired/upgraded Moon and Martin. Oh, and the astonishing Chinese electro-acoustic I got from eBay for £40, and now (thanks to a set of machine heads bought from Taiwan for £7.00 including postage) sounds like a million dollars. Or at least a couple of hundred. ...a north-north-westerly of up to force 7, in fact, and as the captain of the Hrossey warned, there was "a bit of a swell". Last night's trip north from Aberdeen was the 14-and-a-half-hour special via Orkney, leaving Aberdeen at 5.00pm and arriving in Lerwick at 7.30am. The ferry gets into Kirkwall at around 11.30pm, which means, if you're asleep, that you're woken up by immense bangings and crashings from the car deck, as the chains holding down the freight containers are unleashed. Despite some really violent slamming (up and down, rather than side to side) movement, I had been asleep since 7.00pm, thanks to Phenergan, for the first time unmixed with alcohol. That may account for today's lack of ultra-hangover, but didn't stop me waking up in Orkney. Never mind, I was asleep again in minutes, dreaming that we arrived late in Shetland, and I ate porridge for breakfast. Neither of which turned out to be true. The worst of it is, it was a stunning, calm morning in Shetland, and when I got home, nobody had any sympathy for me having survived a hideous night on the boat. Or believed it had happened. I did not, of course, mention being unconscious. Maybe I dreamt the whole thing. Actually Nils, who works on the car deck, told me it had been much worse for the crew, whose cabins are in the ship's bow. I can't imagine what it's like in serious weather, like the hurricane force winds I once found myself at sea in, courtesy of P&O. Them were the days! Why is this computer screen swaying from side to side? To Glenesk, one of the Angus Glens, one of the (no doubt many) surpassingly beautiful parts of Scotland I had never been. Until preliminary discussions began on me taking over scriptwriting duties on The Broons and Oor Wullie, and a meeting was convened with me, artist Pete Davidson (who lives in Glenesk) and DC Thomson comics supremo Dave Donaldson. That was in the summer of 2004, and Dave and I swept impressively into Glenesk on our motorbikes. At least, Dave, on his new Triumph, did. I, aboard an old eBay-bought Kawasaki, was more cautious, lest the fairing fell off. Fast forward 20 months or so and last night saw the three of us talking Oor Wullie around a roaring log fire, this time for the benefit of a BBC Scotland documentary. This will be a sequel to last Christmas's Broons film, and goes out to co-incide with Wullie's 70th anniversary on 8th March. -Wullie has no last name, though his dad is called, ahem, Dave. -In the early days of Oor Wullie, he had a baby brother, who vanished. 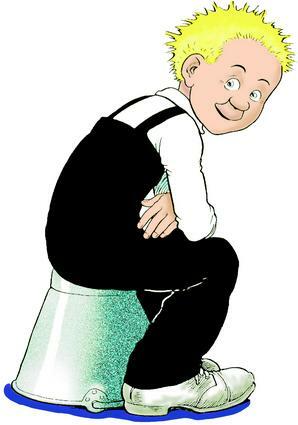 -No-one has ever written Oor Wullie scripts on a weekly basis. Until 20 months ago. No wonder I've been finding it tricky. Many more Wulliefacts will emerge in the documentary. The most astonishing thing about last night for me, though, was that the attempt by Dave (loud accordion) and myself (guitar) to play 'Happy Birthday' as a Wullie cake was ceremonially cut, was scuppered by the fact that Happy Birthday is hugely expensive to use in any broadcast context, as it is copyright and can only be played by permission. Crivvens! It's a pedometer thing. The deal is, apparently, that the average sedentary person takes 5000 steps a day, and that every step above 10,000 represents A Very Good Thing, burning off calories, increasing fitness, wearing out shoe polyurethane, pavements etc. My recent attempts to stave off the wear, tear and flabbiness of age include walking around with a step-counter strapped to my trousers, and so far...I've got sore feet. I left Glasgow at 7.30 this morning (not on foot - in the recently-acquired Forester), hitting a fast-moving flow of traffic that kept going until Perth, which I encountered just at rush-hour. The Subaru behaved impeccably throughout, despite being loaded beyond reason with shelving from IKEA, on which I conducted an opening-time raid at 10.00 am, Sunday. Only bought the shelves (45 IVAR shelves, 10 uprights....guessing measurements, which was probably stupid). And of course, the other stuff you can't leave IKEA without - six jars of herring, eight packs of coffee, batteries and two chopping boards. All for the price in Lerwick of...a chopping board. Glasgow was great. I stayed, as has become a habit, at the Sandyford Hotel at the Kelvingrove end of Sauchiehall Street. Only £35 a night, clean, basic, good parking (though someone ripped off my radio aerial on Saturday night, hopefully not with symbolic intent) and a substantial breakfast at sensible times. Plus you don't need to check out until noon, though I've always been on my way before eight for some reason. I saw three movies, all in their own ways, extraordinary - Werner Herzog's documentary Grizzly Man, with Richard Thompson soundtrack; the disturbing and immaculately acted Hidden, and Jarhead, a Full Metal Jacket for the noughties. I keep feeling a lurch in my gut when one particular scene from Hidden (or Cache, if you prefer) pops unbidden into my head. And there are scenes from Grizzly Man still bouncing around in my brain - Herzog is amazing. See it before the fictional treatment, starring Leonardo Di Caprio as bear-obsessed Timothy Treadwell, grabs all the attention. And the animatronic bear steals the show. Ferry tomorrow. Seems I've hardly been home. Forecast was for winds tomorrow night, but this extraordinary calm weather may last until Tuesday of next week. It's like spring. Only warmer. Heading for Glasgow on Saturday via Dundee (guitar repairs)and then back to Aberdeen on Monday, hopefully in time to interview Paul Weller. Hey Paul! did you REALLY say that about James Blunt? I sure do hope so. Wanna buy a hotel? We don't have a local bar and we're suffering! 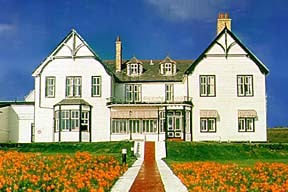 This is the St Magnus Hotel (formerly the St Magnus Bay Hotel) in Hillswick, the township in which we live and breathe and have our being. It's been empty and unused (though sort of maintained and, we hope, heated) for some 18 months. The owners, a company from Canterbury called, wait for it, Canterbury Travel, have been peculiarly enigmatic about its plans for the place. On the one hand, the firm claims it's uneconomic to open it - at a time when Shetland's tourism industry is, if not, booming at least relatively healthy. On the other, all attempts to buy the place have been either ignored or met with obfuscation or disinterest. Now, obviously, we need a bar. The whole Northmavine area needs a bar, and the St Magnus was, in recent years, the only one. That wasn't the only reason a community buy-out was mooted, but it's good enough for me. Let alone the fact that confused tourists are constantly seen peering in the windows. Good grief, this is easily the most picturesque part of Shetland - yes, we now have the excellent Eshaness Cafe, but Hillswick needs its hotel. I mean, it's beautiful, isn't it? It's a Norwegian structure, built originally in Glasgow as part of the Norwegian exhibit at the 1901 Great Exhibition. It was dismantled afterwards, then floated on a barge north to Shetland, where it was re-erected at Hillswick, and became a luxury retreat for adventurous travellers. It offered all kinds of sporting activities. There was even, allegedly, a golf course. and some of the best sea trout fishing in the world (long gone, alas). Adobe Photoshop makes it look a bit better than it actually is, but it's fixable. Go on, you fancy a new life in the northern isles, don't you? Canterbury might even put you in as resident manager - I hear they've been looking for someone. Or we can hope that our local Initiative At The Edge Group succeeds in its efforts to buy the place.Though weirdly, Canterbury refused the group permission to carry out a survey. Why? the place has to be a drain on resources? Menwhile, it's 11 miles by foot or bike to the nearest bar. No driving obviously. This situation cannot be allowed to continue!